1. ME - Do you just hunt deer? ERIN - Dad got a moose permit last year. I did not get drawn this year, but I concentrate purely on deer and moose. 2. ME - What do you think about the "women’s" hunting clothes? Would you ever wear pink camo? ERIN - No. Maybe I am a little too much of a feminist, but in my mind, if you are going to hunt, wear hunting clothes. They don't label its 'men's hunting gear' and 'women's hunting gear' its just hunting gear. I would rather wear my red plaid wool hunting jacket than a pink camo hat. ME - Erin isn’t that pink your wearing in the picture you sent me? ERIN - I know, I’m busted for wearing pink, but my love of monkey thumbs acknowledges no color. ME - Ah so there is a little know clause in the annuals of hunting, allowing you to wear pink if monkey thumbs are involved? ERIN – This line of questioning is what is going to lead you to a broken nose. ME - GULP! Moving on to question three. 3. ME - Do you ever blog about your hunting experiences? ERIN - On my blog: http://andastrongcupofcoffee.blogspot.com, I have written about hunting and there are pics when I went moose hunting. Then I abandoned my blog and skipped writing about deer season. 4. ME – Do you have siblings that hunt? ME - Why didn’t your sister get into hunting? Did you shoot-up all of her Barbies? ERIN - Funny thing is I had all of the Barbies. I loved them. I had the Townhouses, convertibles, the whole deal. 5. ME - Are you part of any of the online hunting communities? ERIN - I use to follow some hunting blogs on Twitter but nothing was relevant to me and/or interested me. 6. ME - Ever hunt out of state? ERIN - No, but Dad and I are going to go Elk hunting at some point in our lives. 7. ME - How do people react when they hear you’re a hunter? ERIN – It’s very interesting to look at the reactions of people when they find out I hunt. It has been my experience that women are stunned and always say "how can you kill something like that" (my reply is usually "with my gun") while men are impressed. I had probably 5 or 6 guys check with details, pictures... one Red Cross volunteer bought me a cheesy plastic deer magnet which I love and keep in my office. I have also found it to be an incredible networking/fundraising tool. If I can get people talking about hunting of any kind or being outdoors, once they know I hunt, they seem to listen to me more and they will try to test me "what model is your gun 700 or 702?" (it’s a 700) "what grain bullet do you use?" (180) Once I answer them, they know I know what I am talking about, its like I gain more credibility. Its weird but definitely something I have noticed in my fundraising career. Its also really interesting how different hunting is for men and women - or how it’s viewed. Guys can't get over the hunting thing with women. I don't know if they are the ones who did not grow up with women hunting or hunting in general or if they just can't picture a woman cutting open and gutting a deer or if its the idea of a woman killing something. I'm not sure. 8. ME - Can you pee in a deer stand? ERIN - I don't pee in a tree and I schedule my peeing. No liquids before I leave in the morning. Pee break at lunch and then again when its dark. I can't pee in a tree so if desperate I climb down and pee in the woods. 9. ME - Do you host an all girl deer camp? ERIN - I have no idea if there is an all girl deer camp. I learned everything from my dad. 10. ME - Is you gun bigger than mine? ERIN - I shoot a Winchester 30-06 with a Sterling scope and yes I can guarantee it is much bigger than yours. ME – Why do I suddenly feel so inadequate . . .
11. ME - Are their unique challenges to being a female hunter? ERIN - I don't really know what unique challenges there are as far as hunting goes - maybe the emotional aspect. I can do everything in the woods a guy could do (minus pee from the tree stand). 12. ME - Any funny outdoor stories you would like to share? ERIN - I once had my hair dyed in the morning and went out hunting in the afternoon. It was hot out and I reeked of dye. Dad was about 20 feet from me and we heard the all might snap of a branch. Then, we heard a blow, and then another and then what sounded like sneezing, as the deer smelled me ran in the opposite direction. Dad just started laughing and we decided that I am only allowed to dye my hair before the season starts and then after the season is over, or after we get a deer. I’m dedicated to the sport like that! Also, when I bought my hunting license the first time, I went after I had a manicure/pedicure and the full on hair styling for my best friend's wedding. All dolled up, went in and asked to buy a license in a small country store I proclaimed to the woman behind the counter that "I wanted to sign the paperwork to allow me to kill Bambi's dad"! She looked at me really weird and I am fairly sure my comment blew her mind! 13. ME - So understanding you live in a big city and according to our previous conversations, can’t stand the heat and would most likely die if it wasn’t for AC, all things considered you seem kinda girly to me, would you like to refute this claim? ERIN - I picked out my wedding ring based on hunting; nothing I would want to risk loosing while gutting a deer and something that would not catch on my glove going on/off my hand. ME - Point taken, I retract my previous statement. You are much tougher than I am. Please don’t punch me in the face. 14. ME - What interest you related to the outdoors? 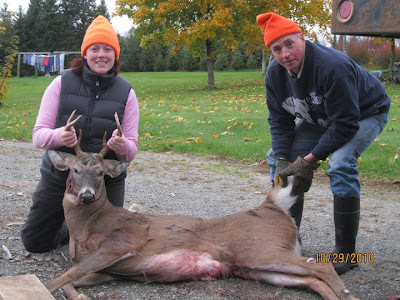 ERIN - I would like to find more women's hunting blogs or Maine hunting blogs. I definitely printed and read the Deer Plan from IF&W. Chandler Woodcock was also my English teacher in Skowhegan. I have met with him to find out about getting on a board or committee through IF&W. If you know of any, please let me know. I would love to be able to give a voice to young female hunters. 15. ME - Can you please supply me with a brief history of how you started hunting? ERIN - I started going hunting with my dad when I was 20. He has hunted forever so it was something I was use to. We have about 400 acres that we hunt on. I know, the first season I went, I was so loud. I snapped branches, crunched leaves, tripped... I also did not carry a gun. I can't remember if it was the first year or second that Dad shot one when I was with him. I rattled the horns, gave myself a blood blister and called in a 4 pointer. Dad asked if I wanted him to shoot it and I, of course said yes! It was 112 pounds, but I was so excited. I then took Hunters Safety and Dad and I built a tree stand in the winter of 2006-2007. Dad said I was in charge of bringing home the meat - no pressure. I had never shot the 30-06 before and Mom said it would kick so hard I would fall out of the stand. So, I shot it twice out behind their house. Dead deer target both times. On Nov 17th at 6:30am, I spotted a small buck coming down through some trees towards the stand. Shaking, I got into position and did what Dad told me. Line up the sights and never lift your head. I remember asking Dad if I could shoot it, pulling the trigger, seeing the back leg come up and then asking Dad if I shot it. Ha! My first deer 115lb, 4 pointer, dead with 1 shot. I was so excited, called my Mom, she didn’t answer so I called my Grammie. She answered and now, whenever I get a deer, I call Grammie first. Gotta love family traditions. My Grampa gave me his gun, another 30-06 after that. In 2009, we built our Sky Condo. It’s huge - 12 feet off the ground and could handle 3 grown men, its fantastic. Again, only Dad and me are allowed. The first year, we saw triplets with their mom and in total, probably 17 deer throughout the season. I was walking around one afternoon in 2009 and shot my doe with a 30-30 open sites. I dropped her, but didn't kill her. The sound she made was terrible. Dad had told me that once you shoot a deer, do not chase it because it will keep going - stop and let it lie down and die. So I did, but my doe got up and left. She stumbled, wobbled and walked off. I assumed she would die out of sight. The next season, last season, I was ready. I also went back to my scope and my 30-06. I was so excited we had put up the trail camera and were seeing many deer. Plus, after loosing the doe, we needed to get some meat in the freezer. Opening day, 7:45 AM, I spotted something moving across the field. I lifted my gun to look through the scope, Dad looked through the binocs and said "its a deer!" I tried to find it, but all I saw was a tree. Dad lifted his gun and told me to shoot. I said I didn't have a shot and if he did...boom! He dropped it and then went scurrying down the ladder and across the field. He shot it one more time in the head. It was a beautiful 150lb, 6 pointer. Again, I took pictures, I have them from every deer I have killed with Dad. So, that’s my hunting history up to this point. It’s so much fun, the anticipation, and the build up, the never knowing if a deer will step out in front of you. And being with my Dad. Even though we don't talk much while we are out there, it’s an amazing experience to share with him. I love it! ME - Thanks a Ton Erin for Providing me with a little perspective on what it is like to be an outdoor woman. Look forward to reading about more of your adventures on your blog! Great job Erin! Clearly Rabid has issues. Can you imagine what kind of sick and demented mind would even contemplate the shooting of Barbies? But I have to admit the peeing in the tree stand question was very thought provoking. @Penbayman - that was his first question to me. I knew I had to do the interview after that. HA! Really enjoyed this interview/post....especially some of the questions you came up with. I have to admit that some Sprite Zero may have came out my nose from laughing. I will definitely check out Erin's blog. You don't find many outdoor women that hunt and blog about it!